Coming out of my Depression: Now what? I have been deeply depressed for the past 6 1/2 months. I am talking severely depressed where I did not leave my house other than to get groceries with my husband a few times a month. I did not talk to my friends and for the most part did not talk to my family except for family gatherings. I was even nervous at family gatherings because I did not know what I would say as there was nothing positive to talk about. I used to get online and work on my mental health advocacy work and bipolar bandit blog and the social media attached to it when I was depressed and I did not even do that. I spent most days watching television knowing that my life was wasting away. I had ambitions, goals, dreams and my life was not supposed to turn out this way. I am a hard worker with high expectations of myself and dreams that I know I can accomplish if I can just get stable. The depression was worse because none of the medicines I were taking were working for depression or mania. I don’t discuss medications in my blogs because everyone is different. However, I will say this, I was on four meds that were basically my last hope and at full doses and they were not preventing me from cycling. I have written blogs about what to do when you are depressed and I was so down I could not even follow my own advice. So, here we are now. I had a cold and was not able to sleep sparking a manic episode. Now what? I admitted myself into the psychiatric hospital to avoid getting so manic that I did destructive things like using poor judgment, spending money, reaching out to people I wouldn’t do if I was depressed. The thing that I struggle with the most is that I don’t know what the “normal” Michelle is. Is it the one who when I first come out of depression and start feeling more like myself or is it the hypomanic one that is ready to tackle all. All I want is to be back to the 13 year old who before I started getting depressed had her life laid out for her and had confidence she was going to reach those goals. Despite this horrific illness, I was able to overcome many depressed and manic episodes and graduate from college and hold down several jobs. However, when the psych meds stopped helping and started causing medical problems, I was forced into disability. This was supposed to be temporary, but almost 15 years later, I still am wasting away. I have done some things like founded Advocates for People with Mental Illnesses group on FB (largest of its kind), Mental Health Advocates United Fb page and twitter pages that go with it and a website too. 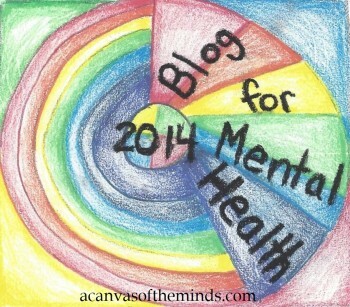 I also blog for bipolar bandit and have a FB page, Twitter page, and Pinterest page for that. I also volunteer for an organization I started in memory of my mom called Spreading Kindness Lande Foundation. I also worked for my dad part time for his businesses and learned digittal marketing and data base entry. None of thees things are what I want to be doing today and back when I was 17 and had a very serious talk with God, are what God promised me and what I should be doing now. I have to have the confidence that it will be in His time. I want to be a child psychiatrist and need to get “not depressed’ long enough to apply for classes and start doing interns etc. I know I have a lot of it down because I have been a psych patient for over 30 years and was a teacher and worked with many children with psychiatric problems for about ten years. After I am a psychiatrist, I want to get into politics and possibly at the same time. God promised me and keeps telling me that I will be the first female president of the United States. So far, it is still possible. I have told pretty much everyone I have ever met that and they have pretty much all said they would vote for me. I am talking about people in psych wards and peopl on the street. Some look at me like I am crazy and technically they are right, but who says someone like me can’t run the country? I actually put my name in nomination this past election and started a page, but was discouraged by God and told it was not the time. However, I did know that Clinton would not win because I will be the first. In fact, I have left a long detailed message on her answering machine a long time ago when she was first talking about running about how I wanted to talk to her. I have written to all the candidates, including dropping off letter to Trump and Cruz during the last election and heard nothing. It plays along the lines of people with mental illnesses should be ignored and my letter was probably filed away as “crazy person-do not read”. I have news for the world. Trump is crazy. I like him, don’t get me wrong, but the things he does can be considered “abnormal” and diagnosable in the DSMV. Many former presidents and world leaders are thought to have illnesses like depression, bipolar disorder, OCD, etc. There is no reason that someone like me who has bipolar disorder who is properly treated can’t be the president. In fact, I am better qualified because I think the majority of the problems in the United States comes down to communication and dealing with mental health crisis. I have solutions for that and have written blogs about itl. Take the time to learn more about me and you will see that I am not just manic thinking I could some day lead the free world. So,the title is now what? I luckily have found a new doctor and she has given me great hope that I can get stable and work on things I was set out to do. I am hopeful that my mood swings won’t be so severe and I can accomplish what God wants me to do and I am determined to do. This entry was posted in advocate, bipolar disorder, mental health advoctes, mental health awareness, politics, presidential election, social security disability, Uncategorized. Bookmark the permalink.